Scotland. The search for the Loch Ness monster (or Nessy as he has long since been affectionately named) is yet to produce an actual "sighting", even though the best attempts have been made by professional hunters to locate and publicly exhibit proof of his existence. A top secret speed trial and the mysterious disappearance of Sir Malcolm Campbell (played wonderfully by Alex Lowe) leads MI:13's Harry Crow and Professor Dunning to investigate, however not before toilet stops and heavy rain. Under false pretences (reporter and photographer for the Uncanny Gazette) they make a stop to speak with Miss Vivian Beak (“What sort of person lives in a caravan?” - Harold Crow) concerning the disappearance of the Blue Bird (“Not a blue bird, Mr Dunning. The Blue Bird!”). Before long they encounter some very friendly people (“Who wants to know?”), Nessy hunters, and Doctor Pippin (local general practioner). Of course being The Scarifyers nothing is ever straightforward. Throw in a loch-full of humour and witty one-liners and you have a story worth its salt. 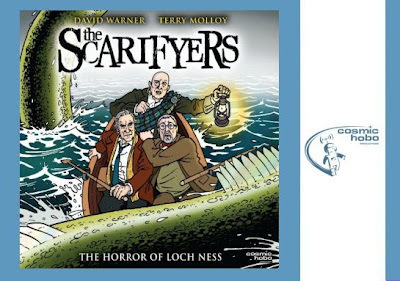 The seventh adventure in the audio series, The Horror of Loch Ness once more stars Terry Molloy as the quite incapable and ridiculously naive Dunning (who is far more at home as a professor and ghost writer) and David Warner as Harry Crow, a man who doesn't suffer fools gladly and is by far the most capable of the two. If previous outing The Magic Circle gave us a new ingredient with the introduction of Crow, respectably replacing the late Nicholas Courtney as Dunning's colleague, then The Horror of Loch Ness takes that situation by developing this new alliance further but still maintaining the quality that we have grown to appreciate and enjoy. Written by Simon Barnard and Paul Morris, there is no sign of a let-up in the magic as both characters and plot are driven along at full throttle (perfectly complimented by excellent music and sound design), never allowing for pause as one intriguing scene leads directly to another equally mind-boggling encounter or mystery. This is the world of The Scarifyers and nothing is as it appears. The Horror of Loch Ness is also Madoc's last performance - he sadly passed away earlier this year. A touching farewell, it now seems, and a dedication to a man who was the the best of his generation. From its first outing with The Nazad Conspiracy, The Scarifyers has been an outstanding contribution to audio storytelling. Cosmic Hobo (established in 2006), the company responsible for its genesis, has quite clearly embraced the art of audio with both hands, developing fine high-quality drama. Other projects released by CH include Sherlock Holmes and Peter Cushing reading his own autobiography (Peter Cushing: Past Forgetting). The Horror of Loch Ness is a sequel "of sorts" to one of the earlier adventures, The Devil of Denge Marsh (starring Molloy and Courtney), but there is no need to worry - you do not require any knowledge of the aforementioned title to enjoy this hilarious romp. This adventure, and indeed the series as a whole, is highly recommended for those who enjoy their audio with a touch of genuine affection and genius - the team's love for the characters and genre is clearly reflected in their work (they are Doctor Who fans, too, so a big plus). So go on, take a trip to the sleepy lock-side village of Inverfarigaig... Oh crumbs! The Scarifyers is available from Bafflegab Productions (formerly Cosmic Hobo Productions).